3. Heaven and earth determine the direction. The forces of mountain and lake are united. Thunder and wind arouse each other. Water and fire do not combat each other. Thus are the eight trigrams intermingled. Counting that which is going into the past depends on the forward movement. Knowing that which is to come depends on the backward movement. This is why the Book of Changes has backward moving numbers. These eight primary trigrams talk about moving backwards and forwards in time. According to Wilhelm, …following this line leads to knowledge f the past, wich is present as a latent cause in the effects it produces. The first four are images. If we look at the first four, we see a line that moves backward. You have thunder, wind, rain and the sun. Following the images (objects) forward, we have the resulting effect, which is present as a latent cause in the effects it produces. The second four are not images. They are attributes. If we look at the second four, we see a line that moves forward. You have Keeping Still, Joyous, Creative, and Receptive. Following the line from the attributes to the effects lead to knowledge of the future, ergo if you keep still, you will be at a standstill, and being joyous results in a future of pleasure. These eight primary trigrams combine to give an unlimited number of results, when you throw chance into the mix. It is quite a marvel to behold in action, and endlessly fascinating to me. Good catch! Readers of Legge miss out on the distinction between images and attributes as he either didn’t see it or just didn’t care enough to include this in his interpretation of the shuo gua. It was this one line that served as the key to unlocking several mysteries (to me) about the trigrams and their place within the whole. After letting it whirl about in my noggin I took pencil in hand and set to work plowing through book iii of Wilhelm’s translation. Several hours later I was rewarded for my efforts. While the shuo gua lists several attributes for each trigram there at many more to be found within the text. 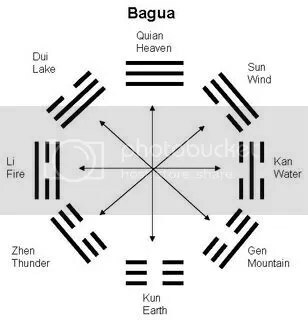 My lists grew and as they did I gained a new understanding of how the primary trigrams along with the hu gua (nuclear trigrams per Wilhelm) serve as paints for the picture the appended judgements present (often the great images as well). While on the throes of epiphany (to me, others may think I’m am a late arrival) it felt as if I was peering over the shoulder of the Duke of Chou as he wrote. Now I can say “Look! there’s the pheasant, this is the jug, here are the arrows, that’s why the wheel broke, that’s the shore and here is the mud.” These seemingly unconnected symbols whose context appeared lost to time (to me) became crystal clear (okay, maybe plasticware clear to this aging American mind). My next task was probe the roles of the places though that’s a story for another day. hi Rick, thanks for your insightful comment. Context is so important when we try to grasp what the author is trying to convey. Without the related connections, it is difficult, sometimes impossible to understand fully the significance of those words. I offer my sincere accolades for your serious efforts at digesting this dense and difficult work.